Updated July 30, 2018! 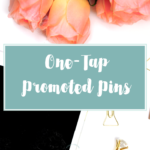 All Promoted Pin Campaigns are now one-tap campaigns. 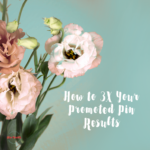 Which means that your Promoted Pins, when clicked, open a new browser tab on desktop and load your site, or they load up your Pin with your website under it on mobile. You are charged with someone clicks your site, whether they scroll down or not. 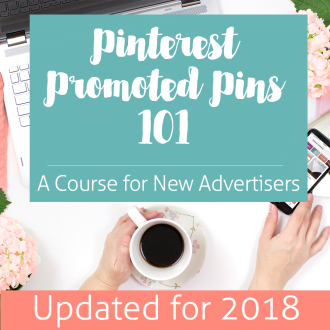 This change will be complete on all accounts by August 6, 2018 and where possible, Pinterest will lower your bids for you (by an average of 70%) because naturally, your click-through rate will climb and many people really only intended to see the close up of your Pin – not to go to your site right away. Many advertisers, especially those accustomed to low cost per click already, are seeing their spend increase without an increase in sales. What can we do to make one tap Promoted Pins work for us? Make it more obvious the Pin is an ad. 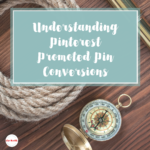 I know, it goes against our nature as Pinterest marketers, but use a button or other CTA to indicate that they’ll be going to your site, “Click to learn more,” etc. Note that “now” is still not allowed on your promoted Pins. Make sure your site loads quickly. People who might not be committed to visiting your site aren’t going to hang around while it loads. Target carefully to qualify your audience. Use only relevant phrase-match keywords, or stick to pure retargeting audiences. Adjust your bidding strategy. I’ve been looking at the data on Pins to see the ratio of closeups and clicks and then applying that to what I bid. So, if a Pin has 300 closeups and 100 clicks, and I would previously have bid $.45/click, I will now bid 1/3 of that, knowing that I’ll be paying for people who really just wanted a closeup, too. Separate out desktop and mobile-targeted ads so you can see how the (very) different user experiences impact spend and conversions and adjust accordingly. Use Rich Product Pins when promoting Products. This gives another signal that this is a Pin you can act on. Originally published March 2017. 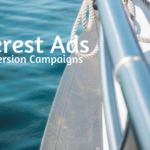 Has your Pinterest Promoted Pins account been upgraded to include one-tap Promoted Pins on traffic campaigns? One-tap Promoted Pins take a user to your site as soon as they click on a pin – skipping the usual close up on the pin. If you’ve been upgraded, you likely received an email from Pinterest stating, “You’re likely to see increases in your click-through rates and a 30-70% reduction in the cost-per-clicks for traffic campaigns.” In a previous article, I was rather anti one-tap. It just seemed like one tap would lead to a lot of money spent on people who would bounce off your site immediately. There are some situations where one-tap is a good option. 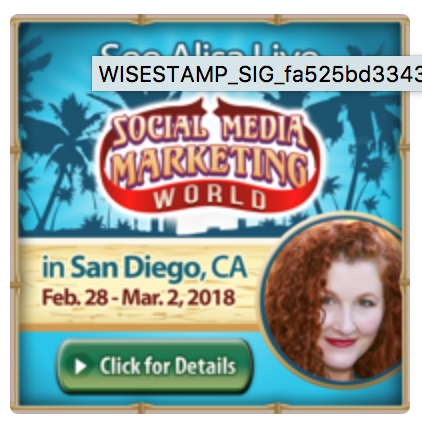 In fact, the day before I presented at Social Media Marketing World in San Diego, I got an email inviting me to have a chat with Pinterest about one tap. Naturally I was thrilled, as I love an inside scoop! While I didn’t check my email in time to see Brian Van Vliet’s response before my session, I’ve had a close look now and I’m happy to modify my earlier stance just a bit. 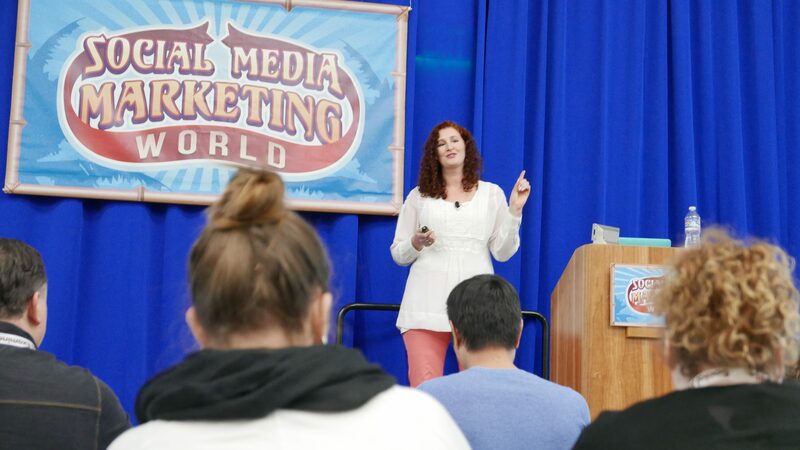 Geeking out on Pinterest Promoted Pins at Social Media Marketing World. I sure make a lot of funny faces. 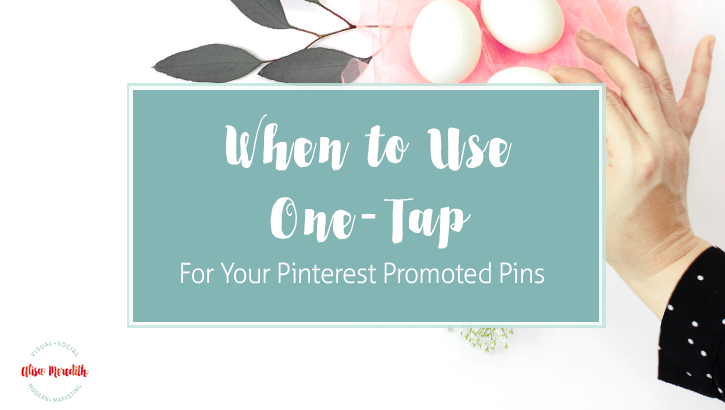 To figure out why it may be that turning on the one tap option (set at the campaign level for traffic campaigns only) might reduce cost per click, it’s important to understand what reduces the CPC of your Promote Pin campaigns overall. The CPC is driven by your bid and by your click-through rate. The higher your CTR, the lower the cost you’ll pay – regardless of what you bid. Because one-tap reduces the steps involved in getting to a click, your CTR will naturally be lower. OK, that makes sense. Why would CPC go down as CTR goes up? Pinterest wants to show Promoted Pins that people like. That not only brings in more ad revenue for them, it’s also a plus for user experience and happiness! If you’re targeting an audience using keyword or interest targeting, or you’re using an actalike audience, the majority of the people seeing your Pin don’t know you at all. 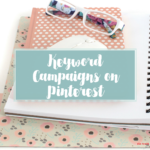 So, being whisked away from Pinterest world to your unfamiliar site will result in a lot of wasted clicks with perhaps a higher spend and fewer conversions. Nobody wants that! 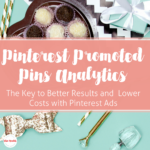 However, if you want to reach new audiences with Promoted Pins, you have little choice. See the tips at the top of this article. Also, if you are accustomed to a whole lot of free repins (saves) on your Promoted Pins, you may be disappointed when those decrease. After all, without close ups, people have to decide to save your pin right in the home feed and that is going to bring down your repins. Part of what we love about Traffic campaigns is all the free traffic we get for months to come because of all the repins! UPDATE: Now, in July 2018, I’m hearing from at least one advertiser that Saves on his one-tap Promoted Pins have actually INCREASED. So, it’s possible that your downstream activity may also increase. If you’re strictly looking for more traffic, you could try one tap, because you WILL get more clicks. But, a better choice for one tap is for campaigns targeting engagement and visitors. These people already know you or at least your content, and are more likely to convert once they hit your site. I like the idea of using one tap with engagement audiences – if they’ve already liked or saved your pin, you know they are interested. If they’ve already been to your site (or even the page you’re promoting) you know they’re interested. Both methods are likely to result in a high number of conversions even though they skipped that close up on your pin. If your “conversion” is a no brainer, one tap could work for you. If you’re giving away something SO good or selling it for such a HUGE discount that you can hardly keep it stocked, you’re likely to keep a fairly high conversion rate on that page while enjoying the lower CPC from your one-tap campaign. 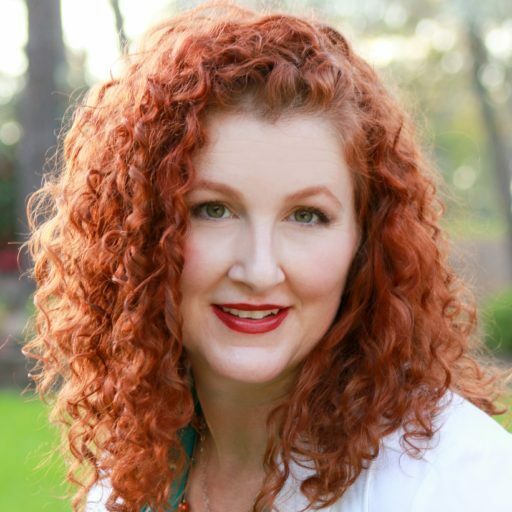 It’s possible that this could work well for other campaigns where you goal is to gather email subscribers – provided the incentive is great enough. For partners with lighter conversions, we have seen success with One Tap in a lot of cases. For example, we have a partner whose goal is checkouts, but their checkout is a free survey which allows the user to then receive a free sample of the product they reviewed. In this case, we haven’t seen significant drop off in conversion rates on their One Tap campaigns, but we have seen significant reductions in average CPC driven by higher CTRs which allows for lower bids. In general, if Partners have signup-type goals, rather than checkouts, One Tap can also work. We tend to see a smaller decay in conversion rates on those types of actions. TEST EVERYTHING! Try a traffic campaign with one tap for a month. Pause it, then create an identical one that does not use one tap. Let that run for a month and compare. Don’t run them both at the same time or you’ll be bidding against yourself and run the risk of annoying pinners who could see your Promoted Pin too often. 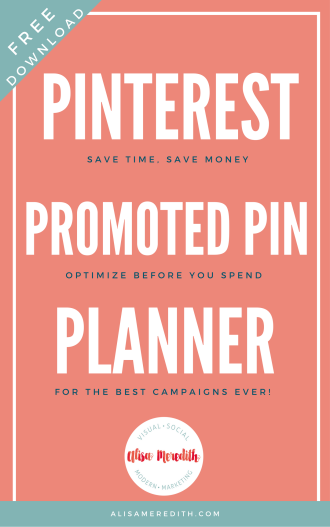 Have you tried one tap on your Promoted Pin campaigns? What was your experience with them? Will you try them again with these suggestions in mind? One-Tap Promoted Pins on Pinterest: Friend or Foe?